Engineers in the Douglassville, PA office of STV Inc. noticed a potential issue in inspection videos that looked like the pipe structures running under a Pennsylvania DOT (PennDOT) arterial highway could have major corrosion and structural issues. 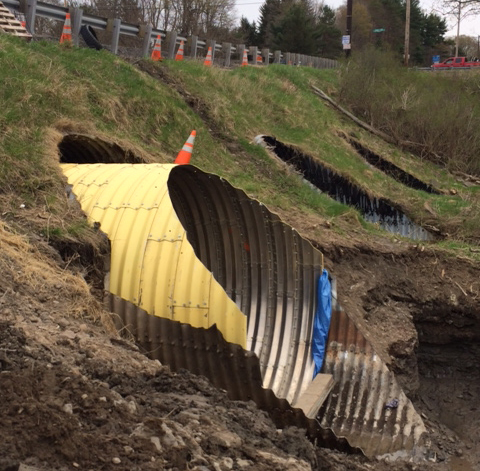 The overall project consists of nearly 8 miles of four-lane divided arterial roadway of SR 6 (US6/US11) constructed in the early 1950’s.The triple barrel culvert carries Ackerly Creek under SR 6 and immediately empties into Glenburn Pond. During a continuing education seminar hosted by STV and conducted by several engineers from Contech Engineered Solutions on January 31, 2012, it became evident that Contech could provide valuable assistance with evaluating the condition of the structures. 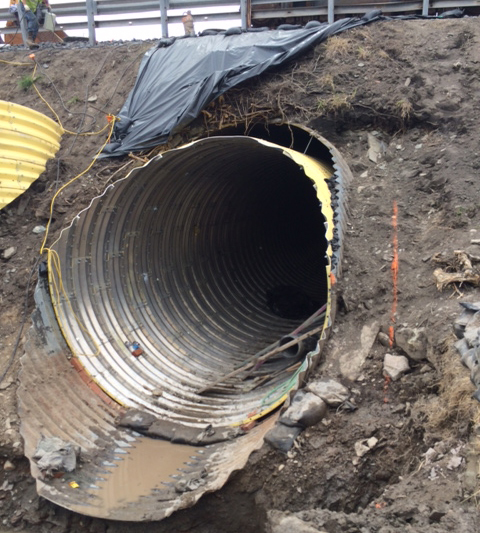 At the forefront of the invention of the steel structural plate culvert pipe systems, Contech has extensive experience with corrosion of culverts and storm sewers as well. After the seminar, a video from a recent inspection was reviewed. Although grainy, it gave a reasonable depiction of the overall geometric shape and the general condition of the existing structure from a corrosion standpoint. It was evident to Contech that the structures were galvanized steel structural plate with a 6” by 2” corrugation and had been field-coated with a bituminous coating at the time of installation. This was a common practice at the time these structures were designed and built. What wasn’t clear was the extent of the corrosion at the normal pool water line, a location roughly three feet up from the invert on both sides of each structure. Once at the site, all three 168-in diameter structures were walked. They had 1’ to 3’ of sediment in them. The water depth and sediment prevented full inspection of the invert but given the apparent age of the sediment, it was presumed that the part of the structures that were buried were probably in better condition than the visible portions. Unfortunately, the fuzzy jagged line seen in the video was a full depth corrosion along the entire length of two out of three pipes. The construction duration for any of the replacement alternatives would lead to including the pipe replacement in the main project, delaying the solution. There was concern that any construction activity and removing half of the length of the pipe would cause the pipes to collapse. Constructing a bridge over the pipes would be better but would also require excavation and probably pile driving due to very poor foundation soils. STV realized the benefits and recommended the aluminum 2-flange pipe lining alternative from the beginning. It provides in excess of 100 years of service life using PennDOT’s linear metal loss rate for aluminum pipe of 0.001 mils per year. This particular grade of aluminum has been used in culvert pipe and small bridge applications since Kaiser Aluminum introduced it to the U.S. transportation market in the mid 1960’s. A zinc-rich primer was applied to the exterior of the plates at the point of manufacture – Contech’s plant in Winchester, KY. The primer prevents consumption of any aluminum during the hydration phase of the grout curing process. 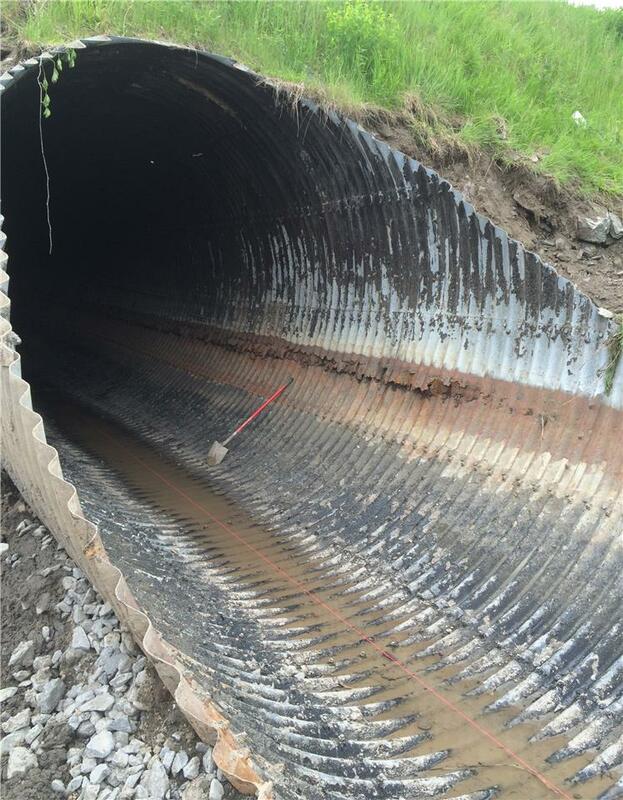 Another positive feature with tunnel liner plate is it can be custom manufactured to the diameter that is required to maximize the hydraulic opening, while also providing adequate space between the old pipe and the liner for constructability. 2-Flange Tunnel Liner Plate provides the ability to build a safe working environment inside an unstable structure as construction advances, essentially acting like a modular internal protective shield. The structural design method used a time proven approach that has been included in the AASHTO Standard Specification for Highway Bridges for many decades. The only deviation was the incorporation of the physical properties of the aluminum tunnel liner plate section selected. Contech provided a structural design which STV then reviewed and accepted. Initially, PennDOT decided to initiate an emergency process to get the structures fixed immediately. Ultimately, they ran the project as a separate rush project following permit, right-of-way and bidding protocol in June 2013. The low bidder was Fabcor Incorporated of Jessup, PA, a qualified and experienced bridge builder in northeastern Pennsylvania. They had participated in a voluntary pre-bid webinar conducted by Contech that walked through a number of construction-related challenges that could be anticipated on the project. Aside from the service life advantages offered by the aluminum tunnel liner plate, it is very easy to work with from a construction standpoint. The heaviest plate only weighed 33 pounds which made sub-assembly of some portions easy. Sub-assembly of half pipe sections of plates occurred at the ends where transporting the segments into place was easily done. It also made movement of pre-bundled plates to the point of assembly inside the host pipes easy. FabCor Inc. completed the installation in August 2014, paving the way for a $46 million overhaul of the 7.8-mile stretch along Route 6 between Clarks Summit and Wyoming County.